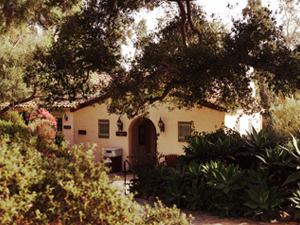 Founded in 1976, Pacifica Graduate Institute is an accredited graduate school in California offering masters and doctoral degree programs framed in the traditions of depth psychology, an interdisciplinary approach to therapy that explores the subtle, unconscious and spiritual aspects of human experience through literature, philosophy, mythology and the arts. In 2014, Pacifica Graduate Institute purchased PlumX™, a system from Plum™ Analytics that helps organizations discover what is happening with their scholarly research through five categories of metrics ― usage, captures, mentions, social media and citations. 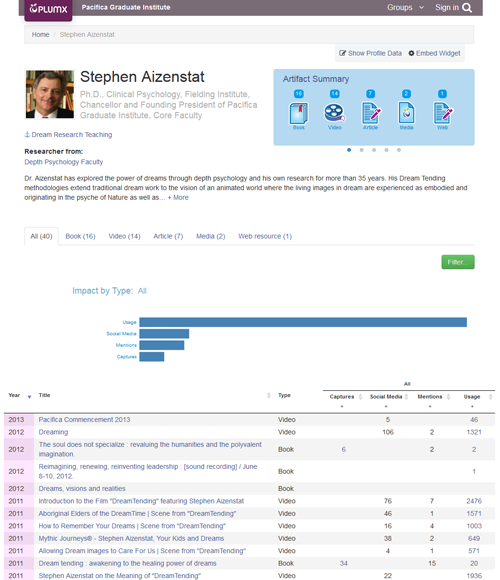 On its faculty biography web pages, the institution has embedded a PlumX Researcher Widget to track and promote the publications of more than 40 core faculty members. By demonstrating the impact of faculty research through metrics, Pacifica Graduate Institute hopes to increase exposure of its faculty, as well as enhance student enrollment. We wanted something that would show the impact of our faculty scholarship,” Dussert explained, adding that SSCI does not track YouTube videos or books. “PlumX caught our attention because so much of our scholarship is done in non-traditional avenues. We have people who are not always publishing in peer-reviewed journals. To capture the impact of both traditional and non-traditional scholarship, Pacifica Graduate Institute embedded a PlumX artifact summary widget on its faculty biography web pages. The artifact summary (Figure 1) provides a snapshot of the faculty member’s research by medium — from books and articles to videos and conference presentations. Website visitors can click on links to view the research or click “see details” for a complete profile (Figure 2). The profiles reside on the PlumX platform and show research impact by type. A bar graph displays usage numbers, social media impressions, mentions and captures. Dussert said the fact that PlumX can track WorldCat, Amazon Reviews, Mendeley and other metrics that comment on books was a major factor in the institution’s decision to purchase the tool. PlumX is the most complete research metrics supplier for books, and since many of the institution’s core faculty publish only in books — often in niche markets — it was important to be able to capture that data. “For our mythological studies faculty, that was a deciding factor for sure,” Dussert said. Dussert said the institution plans to use PlumX data to reaffirm its accreditation. Pacifica Graduate Institute is accredited by the Western Association of Schools and Colleges (WASC), and the next time the organization visits the site, representatives may ask about faculty publications.